As many of you know, we have been working on a major renovation of the parish of St. John the Baptist in Jordan. 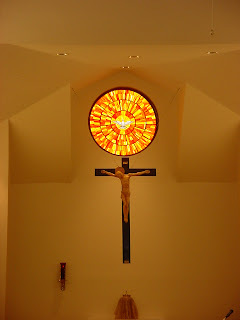 This week the stained glass window for above the altar was installed. This is the work of the son of one of our parishioners. Now if we can get the kitchen done and the other little finishing touches we'll be in good shape. Looks Great Father. good job! I left this project in the hands of a couple of volunteers It really did turn out beautiful. Their talent shows. God has gifted you through them for sure.